Home » Food » When I Said I Wanted Cheese Pizza, I Didn’t Mean THAT Kind Of Cheese! When I Said I Wanted Cheese Pizza, I Didn’t Mean THAT Kind Of Cheese! I thought I’d seen the pinnacle of Unclear On The Concept when wedges of Camembert started showing up on Japanese pizza, but that was before I spotted this one topped with, yes, blue cheese. Mmm, mmm, little veins of smelly melted moldy bits, paired with tomatoes and that perennial Italian favorite, broccoli. I hate to admit it, but I would try that! Don’t ask how I know I would l like it… ever dipped your pizza into ranch or blue cheese dressing? Ha, once again, you made me think of a strange food thing in a different way! When you put it like that, it actually doesn’t sound so bad! Pizza Designer Minions of Hell, return to whatever evil den you came from! There’s no place for you here! 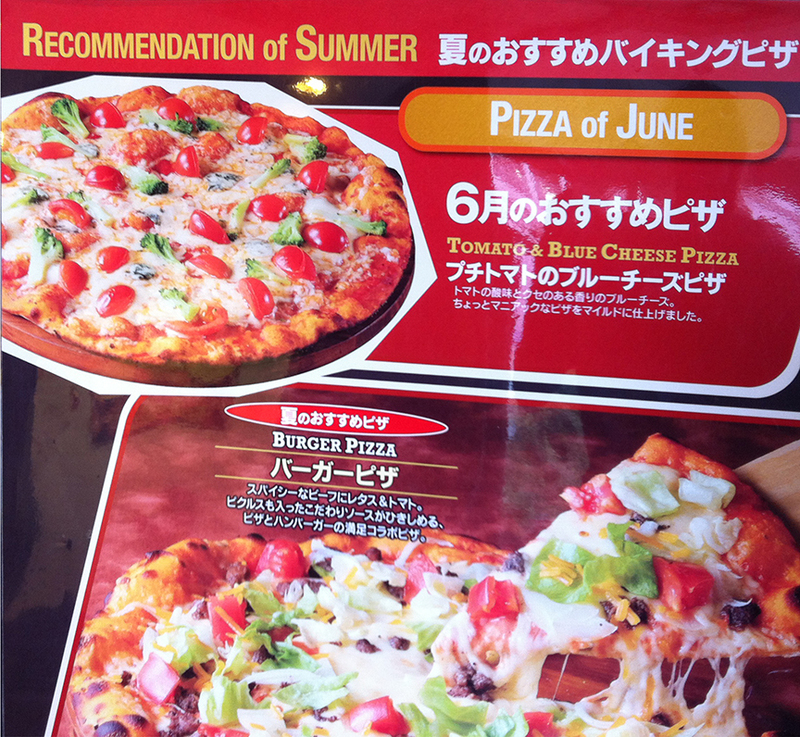 Ahahaha, Japan is the ONLY place for pizza like this! I guess if you don’t really think of it as a member of the pizza family, it ‘s not so bad. It’s probably best not to think of it at all. Hey now, don’t knock bleu cheese pizza. One of the best pizzas I’ve had was a bleu cheese and steak pizza (lovingly called the “Black and Bleu” at the Mellow Mushroom). They went together like broccoli and ketchup (which, according to my childhood friend, was amazing; I never tried it). Speaking of broccoli, broccoli on a hamburger pizza? Not even my moldy friend can save that. I dunno, broccoli…pizza… I mean, isn’t GUILT one of the great pleasures of eating pizza? Why spoil it with relentlessly healthy VEGETABLES? heh. Love that you went to a pizza joint called the Mellow Mushroom, though – sounds like their combos would be quite popular in Japan. Japan is great! I’ve seen all sorts of cool stuff, like the big Gundam and the Gundam arcade pods and the Gundam PS Vita games… There was some other stuff too (shrines, temples, the Atomic Dome, a peeing tanuki fountain…), but GUNDAM!! !